Is red a safe color to decorate with? Is it easy to live with? Will one tire of it? The answers are yes, possibly and possibly. Red is a very strong color and will only appeal to certain personalities. Perhaps if red is a personally appealing color, it will be easy to live with -- but how soon before one tires of it? The color must be very much loved or one will tire of it. An easy out here would be to play up the red in only one room while using it as accent in other rooms. Let's do a den/library in red. Starting with the floor, try a dark wood, covered in the center with a red Oriental rug. The sofa or sleep sofa can be as red as the Oriental. The beauty of this idea is that most red Orientals tend toward the burgundy or deep red rather than the flashy version of the hue. The depth of color brings with it a safe sophistication that warms the room. Throw pillows of patterned fabric containing goldish-tan, red and perhaps black or whatever other color might be in the rug will make the sofa quite inviting. A desk or reading table of dark wood should be accompanied by one or more chairs that are upholstered for comfort and color. The upholstery should have a pattern that complements the pillows, or even the same pattern and colors as the pillows on the sofa. Build-in bookshelves of the same color of wood as the floor is recommended here. A collection of encyclopedias bound in black, red or navy would look great in this room. The walls not covered with bookshelves would be nice in wood paneling, again of the same color as the floor. Pictures with picture lights would make a statement of strength and stability that complements the wood. Desk lamps and table lamps should have intricate ceramic bases -- Oriental, possibly -- to complement the rug. Fill empty spaces on end tables and bookshelves with family pictures, with the framing in collections of all-brass, all-wood or a combination of brass and wood. 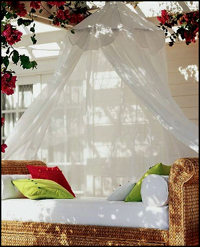 For draperies, use the real thing, not blinds or sheers. Fabric drapes fully lined on wood decorator rods will fit into this setting quite well. The fabric can be red. Patterned or solid -- either way is fine. All this room needs is a fireplace for a great-looking focal point in the summer and a cozy warm place in the winter.